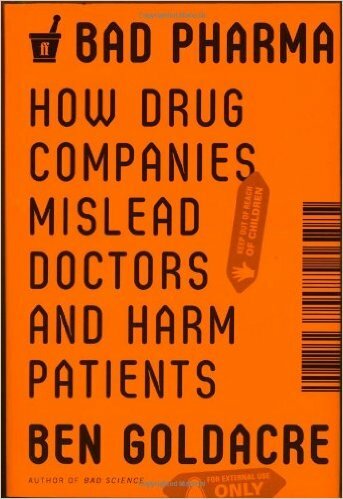 While I have been more acutely aware for quite some time of the areas of misleading and harm that Goldacre spotlights in this book because of my own experience as the medical advocate and primary caregiver for one of my parents and my subsequent extensive research into Big Pharma, Goldacre digs into the details and presents scary and compelling evidence of the total corruption in the industry. From rigged research and faulty data analysis methods to suppression and outright denial of obvious and serious, often fatal, risks and aggressive – and expensive (which is why patented medications are so expensive: most of the money made goes into selling the medication, while a fraction goes into research) – marketing, Goldacre exposes the sordid underbelly of the pharmaceutical industry and how it affects you and me. No one, including consumers, gets a pass in this book and that’s a good thing. As consumers, we bear an equal share of responsibility for this debacle, because we’ve opted for supposed quick fixes instead of doing the hard day-in and day-out work of maintaining our health. We have conveniently forgotten that good health doesn’t come from pills, but instead from our lifestyle choices that cover the span of our lives. We have also shown just how gullible we are to believing the most outrageous and unprovable things and how we erroneously put complete faith and trust in fallible – and, in the case of Big Pharma, egregiously dishonest – and sometimes -ignorant human beings just like ourselves. As bad as Big Pharma is – and those, including the regulatory agencies such as the FDA and physicians who often either don’t exercise due diligence or are as gullible as their patients, that should be responsible for safeguarding the public against these charlatans – we as consumers are equally culpable in the mess that modern medicine has become. The cautionary and troubling information revealed in this book should make us extremely wary of all claims by any health-related products. I learned something in my college statistics course that, unlike most of the rest of it, has stuck with me: statistics can be used to manipulate, to mislead, and to prove anything. But all the gloss and glitter of what may look like compelling evidence does not mean it’s true. We humans are suckers for slick advertising, outlandish claims, and magical solutions. Just as this permeates Big Pharma, it also permeates the so-called alternative and “natural” health products industries. Make no mistake: whatever the neat little marketing brochures with lots of numbers and statistics say, you can guarantee that data has either been manipulated or completely fabricated (this book reveals that in great detail). The bottom line of this book is to trust no one, be very wary, be extremely cautious, and always assume that you’re being led down the primrose path if you’re seeking health solutions in a pill or a bottle instead of changing how you live by changing what you do.